Join us for the 1st Rare Disease Day virtual race sponsored by Running On Air and benefiting the National Organization for Rare Diseases (NORD) and the PCD Foundation. Participants receive a beautiful medal with a double sided world center piece which spins (visit our website www.RunningOnAir.org to see both sides of the center piece). The people on the top portion of the outer ring have a stained glass effect so light will shine through. Every registration will also get a bib number specifically designed for this event. 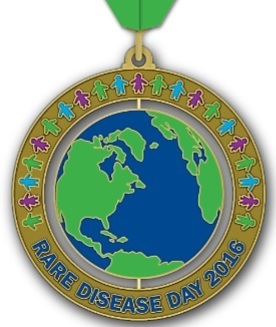 Share your event pictures and event details on https://www.facebook.com/RunningOnAirO2/ and use #RareDiseaseDay. We'll share to inspire others to make a difference and have fun in the process. There are nearly 7000 rare diseases. A disease is considered rare when there are less than 200,000 people with a diagnosis. Your participation in this event will help to make a difference for the more than 25 million Americans living with a rare disease. You can choose how far you want to walk or run to complete this event, whether it’s a 5K, 10K or a half marathon. This event is organized by Running On Air, which is not affiliated with NORD or the PCD Foundation. A portion of the proceeds from this event will go to NORD and the PCD Foundation. All fundraising money goes directly to the charity selected. As a virtual event, you can complete this race anytime in February. The distance is your choice. Medals will be shipped mid to late of February. One of Running On Air's missions is to raise awareness of rare diseases. The founder, Mary Kitlowski, and her sister, both have a rare disease called Primary Ciliary Dyskinesia (PCD). There are less than 1000 people diagnosed with PCD in North America, although it is estimated that around 25,000 people in the US may have the disease. Like and follow Running On Air on Facebook, Twitter (Mary_RunOnAir) and Instagram (RunningOnO2) to keep up with the latest news on upcoming virtual races.